In 2013, Broad Institute member Cigall Kadoch, then a postdoctoral researcher at Stanford University, discovered that approximately 20 percent of all human cancers involve mutations in a group of proteins called BAF, a complex that is also linked to intellectual disability and autism spectrum disorders. However, little has been known about the structure of these complexes, and how they contribute to disease. Now, a team of researchers led by Kadoch, provides a detailed blueprint of how the individual parts of this key protein complex fit together, an insight that could lead to new advances in drug discovery. "This work overcomes a major barrier in the mechanistic understanding of disease mutations as well as drug discovery efforts," said senior author Kadoch, who co-directs the Broad Epigenomics Program and is an assistant professor of pediatric oncology at the Dana-Farber Cancer Institute and Harvard Medical School. Reporting in Cell, the authors shed new light on how these BAF complexes are structured and organized. And knowing a protein's structure is key to understanding its function. BAF complexes control the architecture of chromatin, the packaging entity made up of DNA and proteins inside each cell's nucleus, and regulate gene activity. BAF was first discovered in yeast, subsequently in the fruit fly, and later in mammals. In this latest study, Kadoch's group has mapped out how the various BAF complex protein constituents bind together and make up three distinct complexes within the cell. 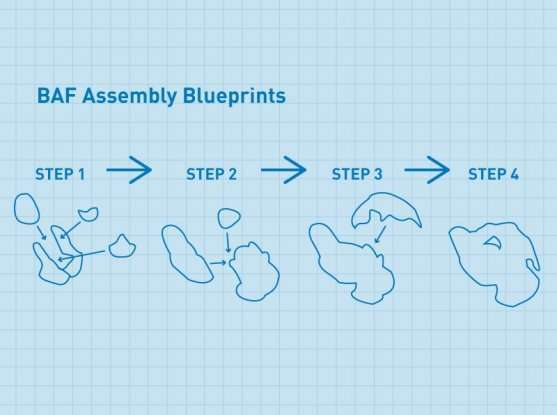 "If you had to put together an IKEA furniture set, you would need instructions for the order of assembly along with the individual pieces," said Kadoch. "For the first time, we provide those instructions or roadmap and list out the individual units, which get organized to build BAF complexes." In addition to revealing the architecture, the researchers were also able to highlight the biochemical effects of a range of disease-causing mutations associated with this complex. "Structural errors in individual proteins making up BAF can interfere with complex assembly and therefore, normal gene expression, leading to disease," said lead author Nazar Mashtalir, who is a postdoctoral researcher at the Broad and the Department of Pediatric Oncology at the Dana-Farber. The team is hopeful that findings from this study will help characterize a large number of disease-associated mutations and guide therapeutic efforts in the field.